The future of shopping centres lies in mixed-use developments, according to the author of Colliers International Consulting’s new national retail report. “I think that in increasingly rare circumstances will we see large-scale retail-only developments,” said Colliers vice-president and director of retail consulting James Smerdon. Regional shopping centres near major markets are particularly well-positioned for redevelopment, as they offer large sites, accessible locations, growing adjacent residential neighbourhoods, commercial zoning and municipal staff and councils agreeable to investment in the community. Their central locations may support strong sales, which makes it difficult to justify drastic changes. However, all it takes is a shake-up in tenants, changes to the competitive landscape, new ownership or a review of the mall’s strategic plan to set the wheels of redevelopment in motion. “In markets that can support condominium tower absorption, they are the preferred addition to a mall property,” said Smerdon. “They are relatively easy to build and get approval through municipal councils. As shopping centres age, tenants come and go, and new types of competition continue to emerge, mall owners can be faced with costly upgrades and maintenance as well as dwindling market shares. The escalation of residential land values, and municipal planning philosophies pointing towards densification and street-fronting retail, can further encourage the transition of traditional, enclosed regional shopping centres into more complete regional town centres. With their added density, residential components, offices and other uses to complement their retail foundation, town centres can satisfy retailers, owners, consumers and planners for the next decade and beyond. One of the biggest shopping centre redevelopments is a 41-acre, Shape Properties-owned site largely occupied by the Lougheed Town Centre in Burnaby, B.C. 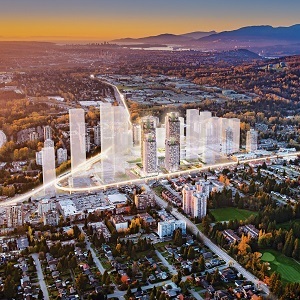 Plans for The City of Lougheed call for the construction of 23 residential towers, ranging from 25 to 65 storeys in height, that could include 11,000 units. Tower podiums and commercial-only buildings would feature 12.86 million square feet of retail, commercial, office and entertainment space. There’s been plenty of recent talk about the impending death of bricks-and-mortar retail in Canada, as several once-prominent chains have been plagued with financial troubles and online shopping has increased in importance. While Smerdon calls it “a lot of hyperbole,” he concedes there’s cause for concern. Canadian retail sales reached $550.79 billion last year, up 5.1 per cent from 2015, according to the Colliers report. Alberta was the only province to experience a drop in retail sales, a 1.2 per cent dip. “Calgary has over 20 million square feet of new retail planned or approved, but much of it is on hold until the economy truly recovers,” said Smerdon. “Retailers, generally, are not risk-takers.